Plant sales are like catnip to me. Winter and summer are safe because there are no sales. But spring and fall are full of temptations, and I generally can't resist. This usually results in a mess of nursery pots in the front yard. 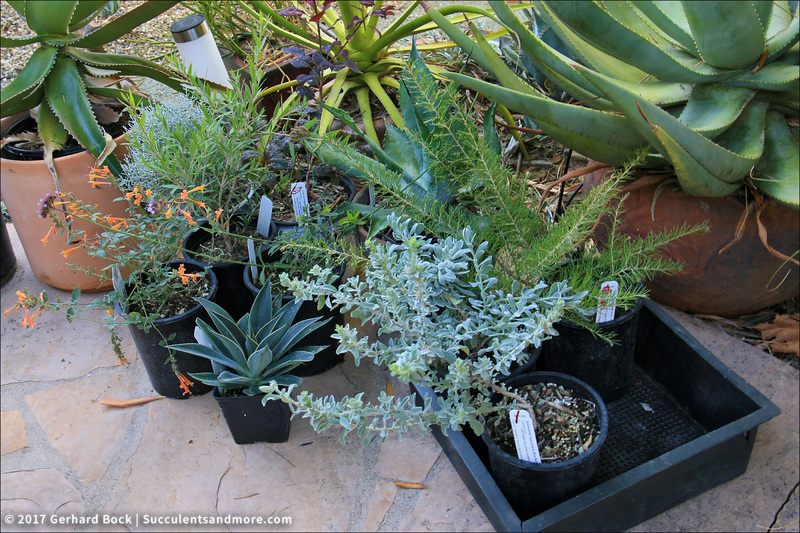 I leave my new purchases in a highly visible location so I'm reminded several times a day that they need to be put in the ground (or in larger pots). 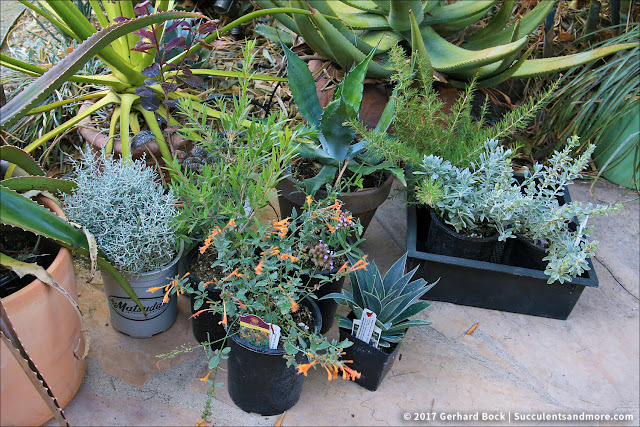 In the last month I've accumulated more plants than usual because of two plants sales at the UC Davis Arboretum Teaching Nursery and a trip to Green Acres Nursery in Sacramento. I did manage to plant the mangaves I bought at the first sale but the other stuff I got—and my new purchases from the second sale—were still there on the walkway near the front door. Sunday was a perfect fall day, sunny with afternoon temperatures in the low 70s, so I got stuck in, as they say in the UK. 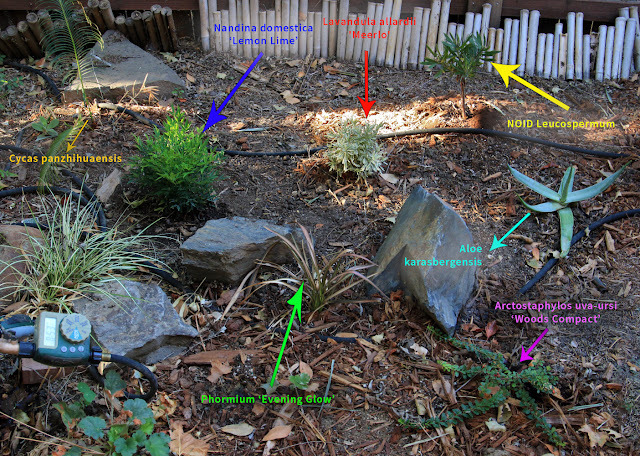 I didn't get everything planted—mostly because I don't know yet where some plants will go—but I made good progress. Read on to see what I did. Four new purchases went in the bed outside the front yard fence. This particular spot faces southwest and bakes in the mid- to late-afternoon sun. 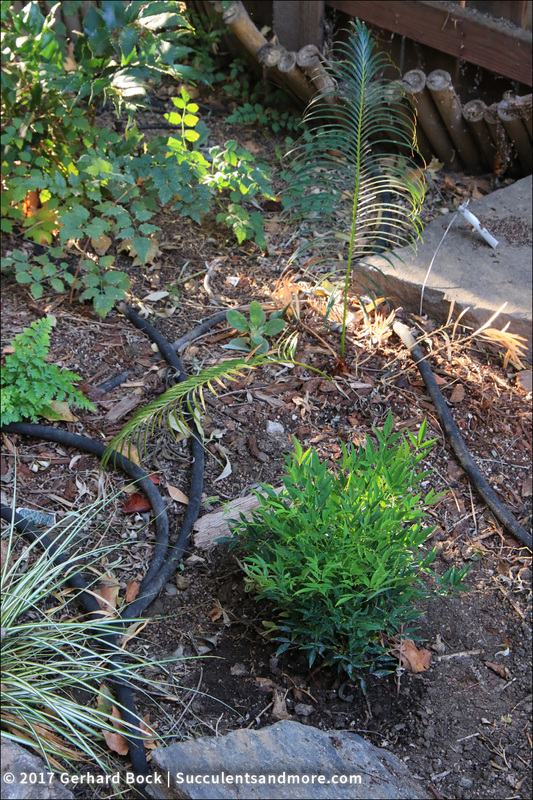 I lost a Leucadendron 'Jester' this summer because it couldn't take the heat (and it probably wasn't happy with my once-every-ten-days watering regime). 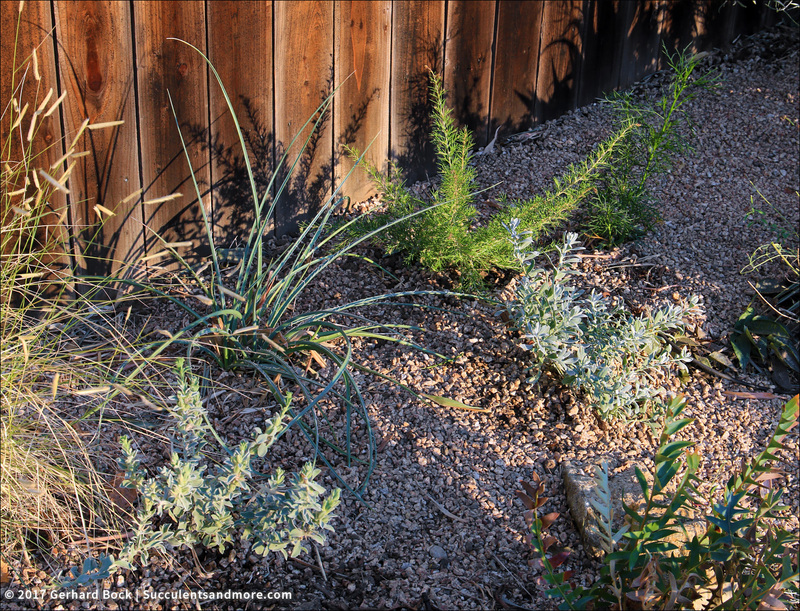 I opted to plant three Australian natives that can take the heat as well as a smaller agastache to provide another textural layer between the agaves. The backyard has been ignored in recent years since we were putting all our focus on the front yard. As a result, there's a lot of work that needs to be done, including removing dead plants that didn't survive the hot summer. 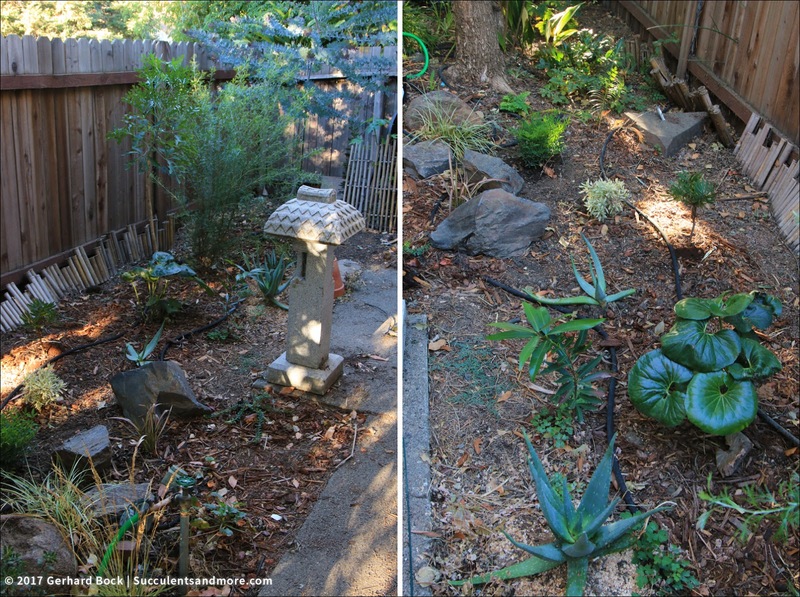 As I mentioned in this post, we've been taking baby steps to get the backyard up to the same level as the front yard. Adding new plants is an important part of this process. Here are some photos of the work I did in the backyard recently. You can see the mahonia in the back against the fence. 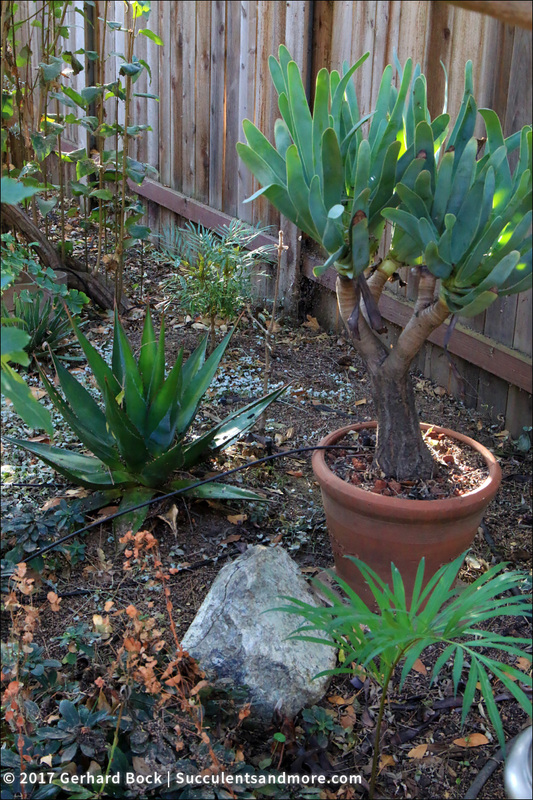 The agave on the left is Agave montana, the aloe in the pot is Kumara plicatilis. The cycad in the front is Cycas debaoensis. Most of my recent work has been in this area (the extension of the bed in the photos above). To help you get your bearing, the chaste tree featured in this post is immediately on the left in the next photo. This means that Aloidendron 'Hercules', our big tree aloe in the desert bed, is right outside the fence. Nandina domestica 'Lemon Lime' is a Sunset introduction. The new foliage is chartreuse, and it stays green year round—no red, ever. Looking towards the south. This is where we had a large chocolate bamboo (Borinda fungosa) and a diseased Aristocrat pear (Pyrus calleryana 'Aristocrat') removed last December. 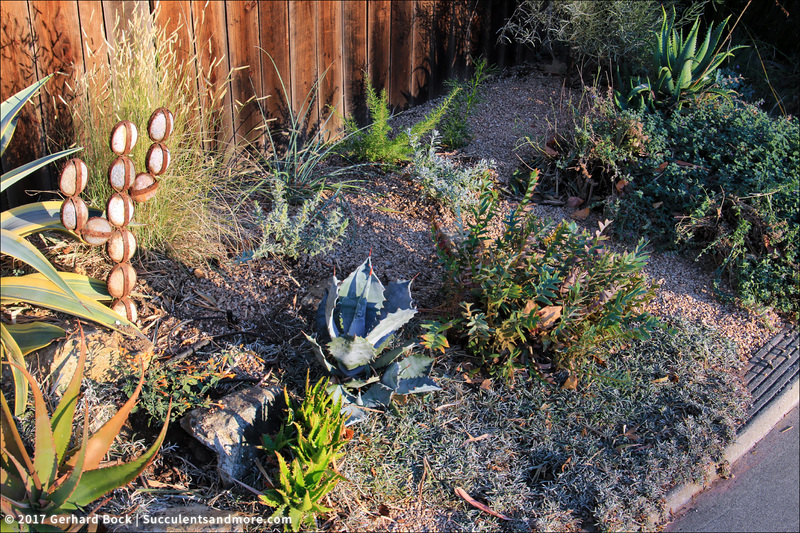 The only original plant left is the Farfugium japonicum 'Giganteum' on the right. 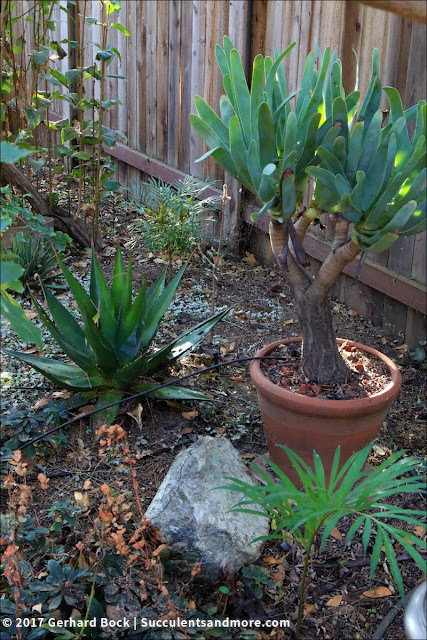 The Aristocrat pear has been replaced by an Acacia baileyana 'Purpurea' (you can see its trunk on the right in the photo above). To the left are a groundcover grevillea (Grevillea 'Wakiti Sunrise') and a taller grevillea (Grevillea 'Flora Mason'). This area still needs a lot of work (and rocks? ), but it should look much more presentable a year from now. I'll post an update when there's something interesting to report. In the meantime, I'm willing the new plants to grow. I haven't been writing much about the backyard in general because there are areas I can't bear looking at too closely. 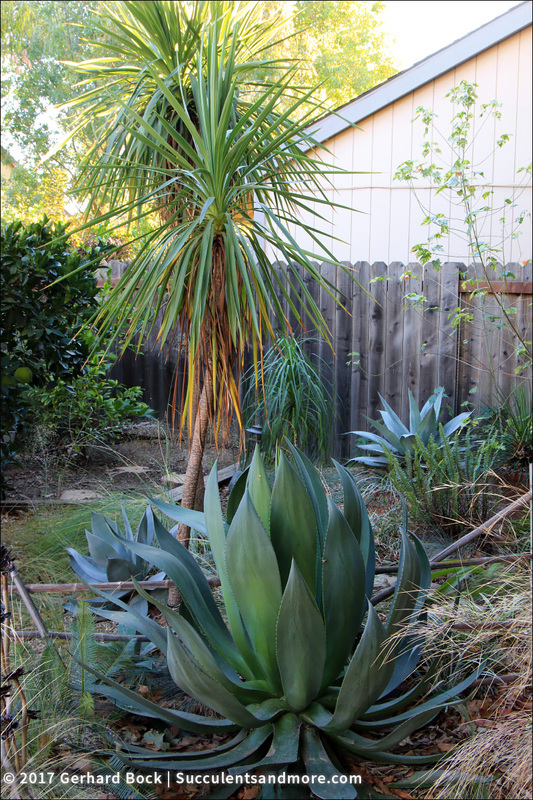 But I do like this vignette featuring several agaves (Agave chiapensis in the front, Agave ovatifolia 'Vanzie' in the back against the fence) and a two green Cordyline australis. They're too small to go in the ground at this time of year—sitting in cold and potentially wet soil over the winter isn't the best environment for them at this size. 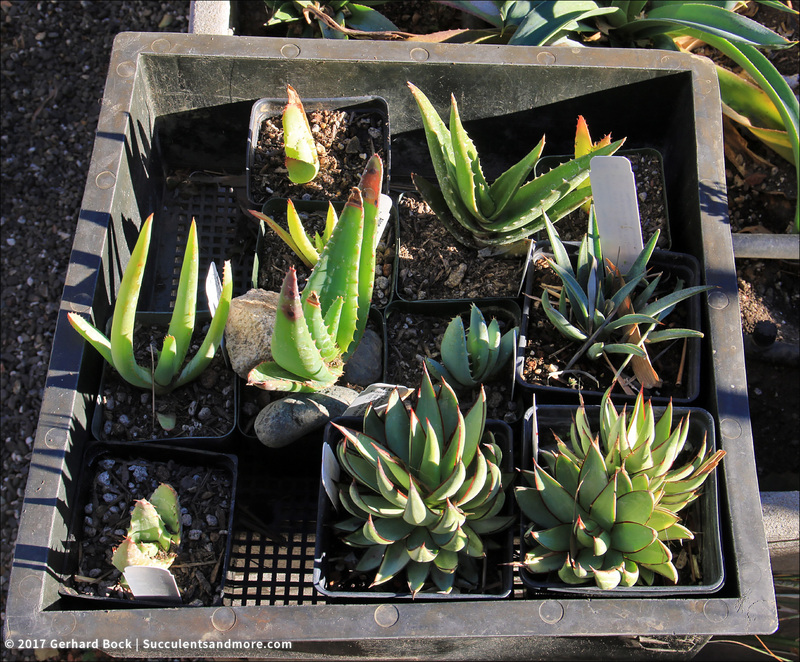 I transplanted them into 4-inch pots where they will spend the winter. With more warm weather ahead, my hope is that they will actively grow for another few weeks. Next spring I get decide what to do with them. But I have plenty of time to think about that. Morningsun Herb Farm just had a 35% off sale but I resisted. However, if they up the ante to 50% off, I *will* go. You have been on a shopping spree! Our continuous heatwaves have delayed my usual fall plant shopping binge. 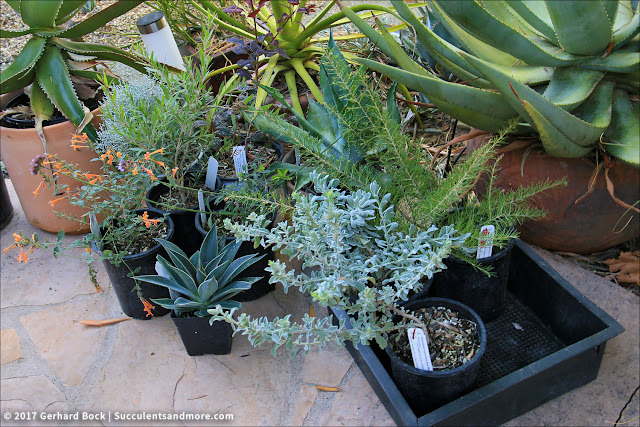 I'm impressed by the range of plants you've found, especially those in smaller sized pots, which are always tough to find here. 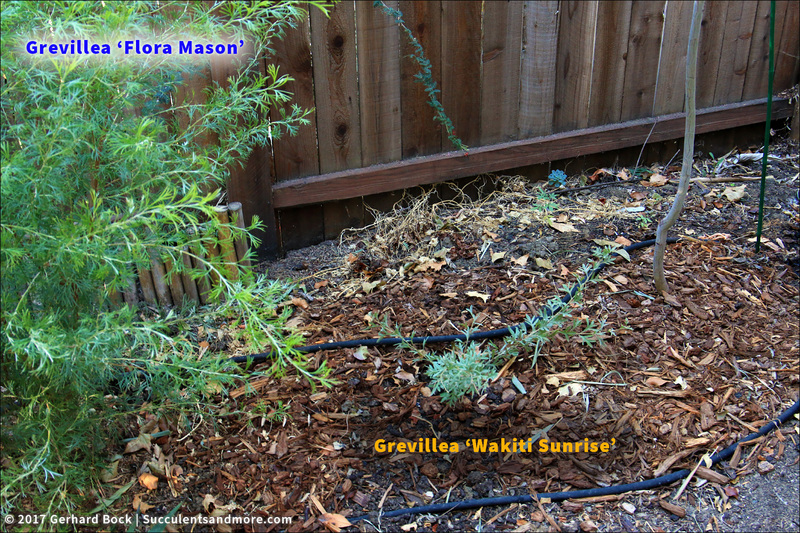 I look forward to seeing some of your new Grevilleas in bloom. I hope your new plants get all the rain they need this winter to look fabulous next year! 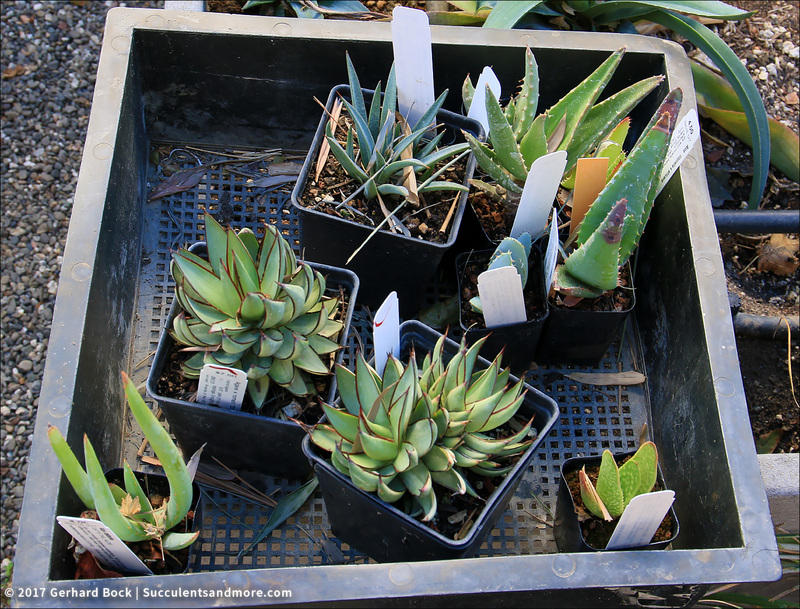 Virtually all the plants at the UC Davis Arboretum sales are either 4 inch or 1 gallon. Much easier to get in the ground! 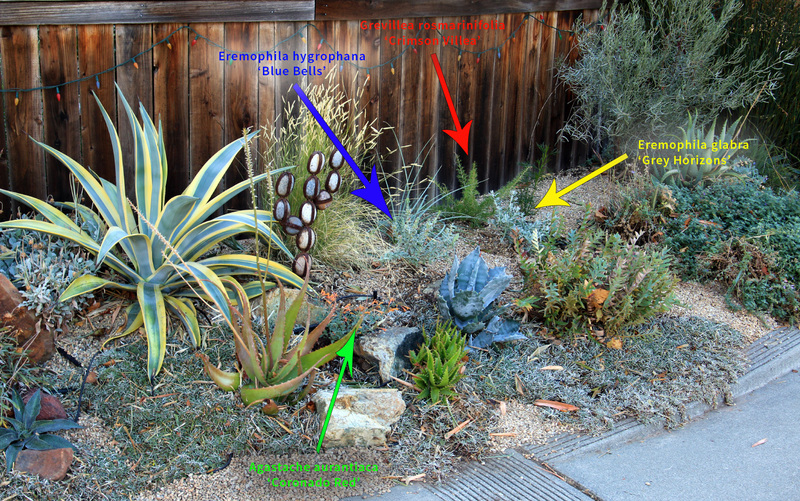 I do look for more unusual plants, at least unusual for our area. New plants are always fun. You chose some very interesting ones. Looking forward to seeing how they do for you. I'm trying to work with what I've got, but new ones have shown up anyway--it is irresistible. I agree 100%, new plants *are* irresistible. That will never change! Wow! Impressive hauls from those sales; equally impressive is the fact that many are already planted. I hope they all thrive for you! You are a patient man! Slowly you are creating your own botanical garden. So many great new plants. I love your Cycas debaoensis. I have a few cycads and I love them. I'm patient and impatient at the same time, if that makes sense! 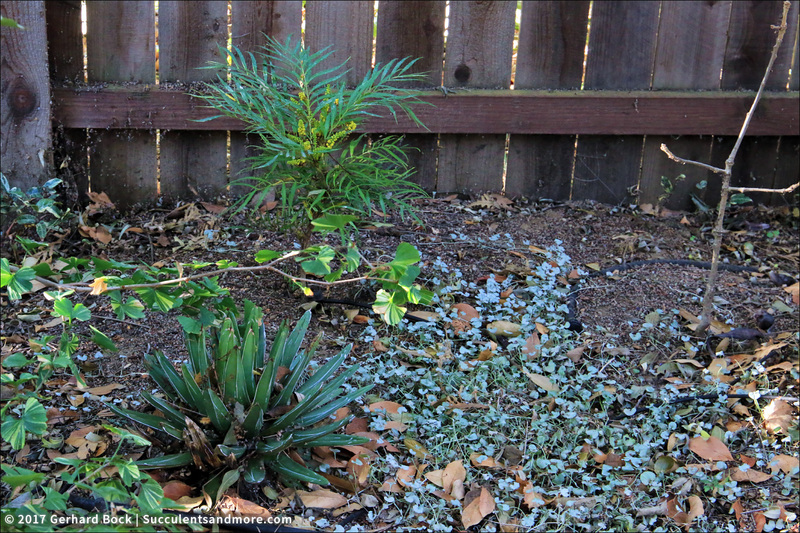 That Cycas debaoensis has been in the ground for three years and it's produced two new leaves since then. Talk about sloooooooow. I am crossing my fingers that there will be good stuff left on Saturday. I'm going to get a membership so I can get in at 9.I'm a member everywhere else so why not there too !Never a bad thing to support horticulture. I think there will be; the Oct 21 sale wasn't that well attended. The inventory list for the Nov 4 sale should be up around Nov 1: http://publicgarden.ucdavis.edu/plant-sales. BTW, the Nov 4 is open to the public the entire time (9:00 to 1:00) so you don't need to be a member. But members get a 10% discount.